A steady gust of an early winter’s wind was whipping through the last few pieces of corn still left standing on Paul Hamilton’s Northern Kentucky farm, their golden kernels exposed to the elements, naked wilted stalks all but dead. The corn here will soon be gone from this rolling farmland and so too will Paul Hamilton’s prized herd of dairy cows. Paul’s family has been on this 80 acres for three generations. His grandfather first purchased the land in the 1950’s before handing it over to Paul’s father, who ultimately sold it to Paul when he was in his 20’s. A legacy of family farming though will end with Paul Hamilton by the end of the year. He refuses to subject his 16-year-old son John to the uncertain life of farming. “If I had to do it all over again, 29 years ago when my dad offered me the land, I would have turned it down,” Paul admits as he struggles to cut a piece of plastic rope holding together a 100 pound barrel of hay. Paul has taken one vacation day in the last four years. There are no sick days for dairy farmers, no holidays and no weekends. Every day his 35 Holstein cows must be milked at 5 a.m. and then again at 5 p.m. to keep them producing. This 56-year-old hasn’t shaven in days; the bags under his eyes are so heavy they seem to stretch halfway down his face. His boots are caked with a thick layer of mud and manure that refuses to come off no matter how much he washes them. And yet he loves it here, if for no other reason than the fact that he knows no other way of living. “When you’ve done it your entire life, it gets to be where it’s a part of you,” he says leaning against the tire of a 1971 John Deere tractor that he repairs almost daily. 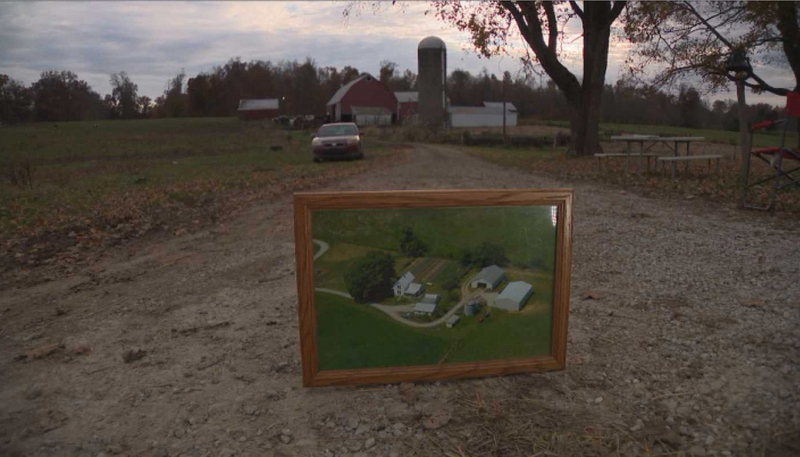 Last month, the Hamilton family farm lost $1,500. The price of milk is playing a large role in the struggle dairy farmers are facing. While most consumers pay an average $5 for a gallon of milk at the grocery store, most farmers only get about $1 from that sale. Nearly 60 dairy farms have shut down across Indiana, Kentucky and Tennessee since the start of the year. Paul’s wife Paula Hamilton has run out of hope. “Always before it was maybe next year we’ll have a better crop, maybe next year prices will go up. And now we’re looking at it and we’re no longer saying next year and that’s really sad,” she said. Sitting in the front yard of the family’s century-old white farmhouse, beneath a bright orange maple tree, a small tear falls down her face. And that is a reality facing hundreds of farmers across the United States right now. A prospect so grim, that some are choosing to take their own lives instead of letting go of farms that have been in their families for decades. “You know I worry about him a lot. He’s working so hard and getting so tired and I wonder if he’s gotten to a point that he can’t come back from emotionally,” Paula says holding her husband’s hand. Farmers are notoriously reserved with their feelings and thoughts. The solitary occupation often leaves some feeling as though they have nowhere to turn as they are facing financial and emotional ruin. 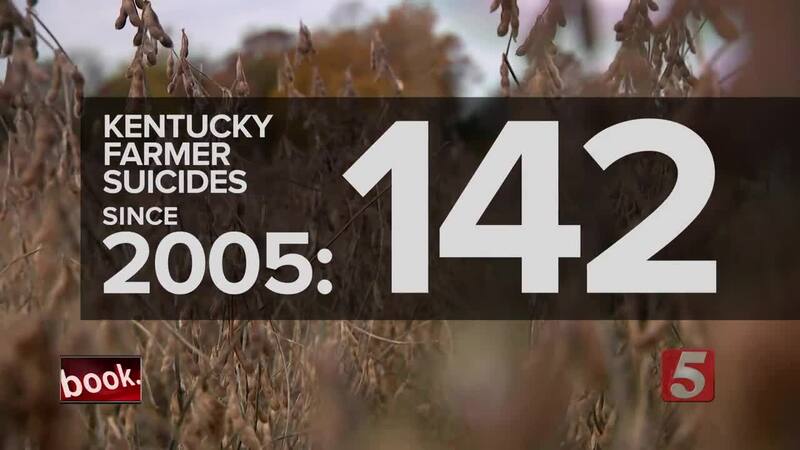 According to the University of Kentucky’s Vital Statistics Office, 15 farmers died by suicide in 2015. The number was even higher the year before as 21 farmers took their own lives. That includes Debbie Reed who has worked as a nurse and professor at the University of Kentucky for nearly three decades. “When someone dies in the farming community people always bring over casseroles, but when someone commits suicide, it’s known as the ‘no casserole death’ because no one wants to bring a casserole over when a person has taken their own life,” Dr. Reed said. But even with everything they are facing, both Paula and Paul aren’t ready to give up until they’ve exhausted every option. Their family’s legacy is all they have left.